Welcome to About Us. This is Rolling Thunder VBC 20th season! Thank you for considering our Program for your volleyball training. Over the last 20 years of operation, we've grown from a small club of 3 teams to one of the top volleyball Clubs in the Great Lakes Region and Nation. Last year 7 teams competed at AAU National Championship and the others finished their season either at the National Junior Classic, Youth Classic, or Pre-Nationals in Chicago. We've put this together to tell you briefly about Junior Volleyball and about our Club, and what it takes to become successful in our program. We invite you to take the next step with us as we begin another exciting season of volleyball. Take the next step to improve your volleyball skills, meet new friends and challenge yourself to become the best you can be! Take the next step and compete at a National level against some of the top players and programs in the country. We hope you will decide to try out for Rolling Thunder and be part of the 2019 season. See you at our tryouts. Junior volleyball programs have grown exponentially across the country over the last 20 years. Today, volleyball is the number one participation sport for girls in the 12-18 year old age bracket. Within the indoor sport itself, boy's volleyball is the fastest growing membership segment. More and more colleges and universities are adding men's volleyball to their athletic programs. Because of the growth of volleyball, most college coaches recruit exclusively from the ranks of the junior volleyball programs and junior volleyball tournaments. The reason for this is simple. Coaches can see many solid prospects in a single day at a junior tournament, while it is difficult to see more than one prospect a day during the high school season. NCAA rules limit the number of contact days a school can be out recruiting in a given year. To maximize their contact days, colleges attend junior volleyball tournaments to see more athletes in a given day. Is junior volleyball only for the college bound athlete? Certainly not! We have programs for kids as young as 6 years old. For many of our members, Junior Volleyball is simply another challenging experience, which should lead to a lot more fun on the court as playing skills increase. As players develop they realize they need club volleyball to remain competitive or to gain an edge over others in order to make their school team. We have a training program designed to help them do just that. We can help, but much of an individual's advancement and improvement is still up to that individual. Athletic talent, size, speed and good work habits are all necessary for top success as an elite player. Players who lack in any of these qualities have to make up for the deficiency in one area by working harder to improve in another. If you have a sincere desire to improve, then you will do well at Rolling Thunder VBC. It is a great place to develop your skills, meet new friends, be part of a team, and grow as an individual. Rolling Thunder Volleyball Club players come in all shapes and sizes. They have a wide variety of skill levels when entering the program. With that said, there is one common tie which binds our successful athletes together. That tie is a commitment. It's not easy getting up an hour earlier than usual just to finish homework, or rising at 5:00 AM on a weekend to be on time for a tournament. Over the years the players in the program have shown that they were willing to make these sacrifices in order to find the time for this program and become better volleyball players. The ones who consistently stayed committed to their goals have seldom been disappointed. Before your child begins this program, take stock of where she is, physically and emotionally. Hopefully your memory is good, because next summer you may find that they have gone through a number of changes. A year in the Rolling Thunder Volleyball Club system is part of an entire educational process. We certainly hope that it's a positive force in your child's growth. Rolling Thunder Volleyball Club is committed to teaching and training young athletes and educating coaches to teach the game of volleyball. We want our athletes to improve, become self-reliant, and develop a passion for the game. We teach the game "part-to-whole." We strongly feel that in order to maximize an athlete's potential, each skill needs to be broken down so that they can correctly learn how to perform that skill with a high level of efficiency. When an athlete can perform the inherit skills of the game efficiently then they can truly develop and play the game at the highest level. We feel that there is value in consistent training. Similar to your child's respective school where there is a standard curriculum set up for every course. It doesn't matter which teacher your child has at school they are going to learn the same standard curriculum that the school has provided. At each and every Rolling Thunder Volleyball practice we have a Lead Coach who oversees all teams in the gym at that practice. Our Lead Coaches put together the practice plan for all teams within specific age level for all practices. By doing this we assure that ALL of our athletes are receiving the same high quality training. Rolling Thunder Volleyball Club realizes the value in Position Specific Training. Therefore, all of our High School aged athletes as well as some middle school age athletes have one positional training night every week. During this practice athletes come in by position instead of with their team. This allows athletes to focus on specific qualities unique to their position. There is also a lot of time spent on position specific training during our warm up segment of team practices for all age groups. The coaching staffs at Rolling Thunder Volleyball Club are individuals dedicated to improve our athletes with the best coaching techniques through the combination of USAV IMPACT, ASEP (American Sport Education Program), and USAV CAP Level I and II (USA Volleyball Coaching Accreditation program). The coaching staff have instructed from youth level through the collegiate level. Our staff is highly committed to developing your athletes' performance, confidence, and knowledge of the game. The Boys Club season begins in early September with tryouts and practices starting in late September. The Boys National Program stops in late February prior to the Boys High School season. The boys then return in June to compete and prepare for the Boys Junior Nationals in late June and early July. The Boys Regional season concludes late February prior to the Boys High School Tryouts. The Girls grade school and middle school Club season begins with tryouts in early October with practices starting in late October for National teams and concluding in June. High School age Girls teams begin their season with tryouts in late October, practices start in mid November and concluding in June. Girls Regional Program practices start in early December and conclude in late March. Please attend the first tryout offered for your grade. If you are on Varsity and you are still competing in the IHSA State Tournament you are still required to attend your first tryout date and submit all paperwork in person. Once your High School season is finished you must attend the next available tryout for your grade and go through the physical testing and skill evaluation. Tryout dates can be found on our website under tryouts. A parent must accompany the athlete at Registration and Check in. There will be a thorough informational meeting to explain the Program during the Tryout. This is a terrific opportunity to ask questions, find out what is new for this season, as well as to listen to other parents' questions and the answers to those questions. The cost for the 2019 Season depends upon the age group and Program. The Club dues includes gym rental, local tournament entries (except qualifiers), insurance, administrative expenses, coaching fees, and practice shirts. In addition, training for specialized positions will be offered at practices for further technical development for all age groups. Speed and strength training through physical conditioning and circuit training is part of most teams' practices to further enhance their on court performance. For more information regarding costs, please contact us. Uniforms, out of state tournaments, national qualifying events, cost of transportation for athlete to these events, lodging, and food expenses while away from home are additional and not covered by the Club Dues. 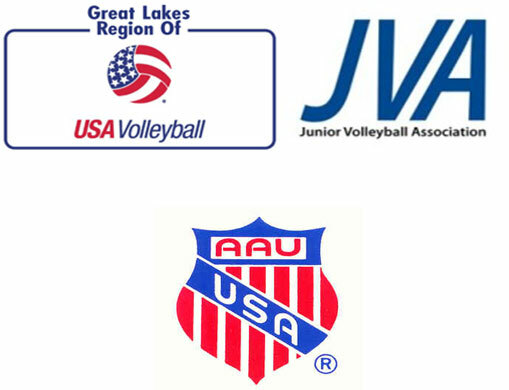 Rolling Thunder Volleyball is a proud member of the Junior Volleyball Association (JVA), Amateur Athletic Union (AAU), and USA Volleyball (USAV). Teams attend tournaments sanctioned by one of these three organizations, based upon the needs of each team.